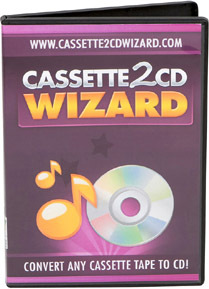 The Cassette2CD Wizard 2.0 software is now included with the Cassette2USB Converter as a free bonus! "This is the GREATEST and MOST SIMPLE software to use to transfer your old cassettes to CD to get excellent QUALITY RESULTS. The software is very user-friendly and does a wonderful job! The video tutorial is easy to follow, as well. It's a true lifesaver for all of us who just cannot bear to throw away those special old cassettes. I am very pleased with this product and give it a Big 5 STARS! Thank you so much!" "I finally...started using the Cassette2CD software. I have to say I am very pleased and excited to be using it. It is working better than I hoped. I thank you and will highly recommend this to all my friends. "My software cd came yesterday and with a little practice, I have actually copied one cassette to a cd. This cassette is approximately 20 years old and I am thrilled to be able to put it on cd. My father had dementia and in the last months of his life, this gospel music would calm him down. I had previously recorded from a 33-1/3 record to a cassette. This purchase was well worth the money. In fact this cd I made has become so popular in our family, I have made copies for my two sisters and 1 brother; When we first put our completed cd is to play a day or so ago, there was a little sadness but we are learning to appreciate the contentment, comfort and joy these songs gave him. He talked very little but when these songs were playing, he calmed down and we could see his mouthing the words to the songs. He loved the old time gospel songs what were played in the Methodist Church and at revivals. Thanks!" I haven't had a chance to try to use VHS2DVD Wizard yet -- I've been to busy copying all my Cassettes using Cassette2CD Wizard *g* and i just love that great program! ... I will be sure to tell all my friends how much i've enjoyed the Cassette program. Thank you so much! I ordered both your Cassette2CD and VHS2DVD Wizard software. I'm a nurse and am transferring many things so our nursing home residents have more quality, inspiring companionship. Your genius is very valuable to the elderly, and although they might not know to thank you, consider this a huge thank you from many, many people. I'll let my colleagues know nationwide.